See it Before it's Built! This is NOT a photograph, it is a 3-D computerized rendering! Do you have difficulty imagining how your building project will look before it is complete? Standard plans offer a flat, black and white, 2-dimensional elevation. Computerized 3-D design gives you a full-color, 3-D rendering so you can see your project BEFORE it is built! This minimizes much of the guess-work and provides tremendous peace of mind. You're tearing out an driveway or patio. What do you do with all that old, broken-up concrete? RECYCLE IT into a beautiful raised planter, walkway or patio. 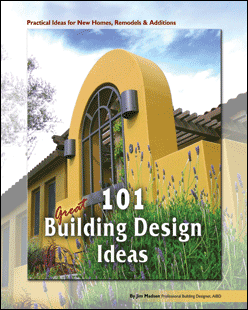 Watch this 1 Minute Design Tip for a great landscape idea.